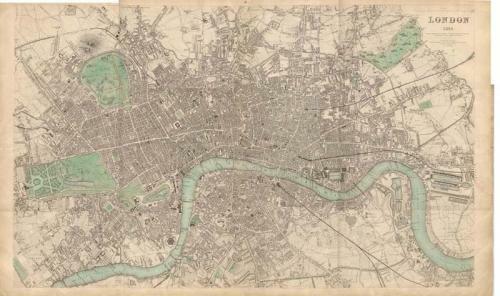 A beautiful oversize map of London clearly dated in the upper right corner. This map was 'drawn and engraved from authentic documents and personal observation' by B. R. Davies. Attention to meticulous detail showing the old Penitentary at Chanter & Wilton (along the Thames) Kensington Gardens, Hyde Park, the Palace Gardens, St.James Park; Grosvenor, Berkeley, Hanover, Cavendish and Bedford Squares (along with many others) the old Grand Junction Canal; tracks the route of the Great Western Railway; Regents Park and the Botanic Gardens (and the Hereford Marquis) the Foundling's Hospital at the end of Red Lions Street, the old "Model Prison" by the Caledonia Asylum north of Edwards Terrace and Park Street South; the New Cattle Market by Brick Fields; Victoria Park and Regent's Canal; plots the course of the Eastern Counties Railway and Whitechapel Road; Southwark and London Bridges (and many others; including the Tunnel!) the West India Import & Export Docks; the Grand Surrey Canal and the Stangate Glassworks. Printed with black, red and green inks. Overall size measures about seventeen by twenty-seven inches (17" x 27"). Certainly most suitable for framing to create a handsome presentation for decades to come. Very good condition with uniform toning, typical of that associated with books and documents that are almost two hundred years old. Colors show rich hues; black ink is dark are clear; paper is crisp and bright.